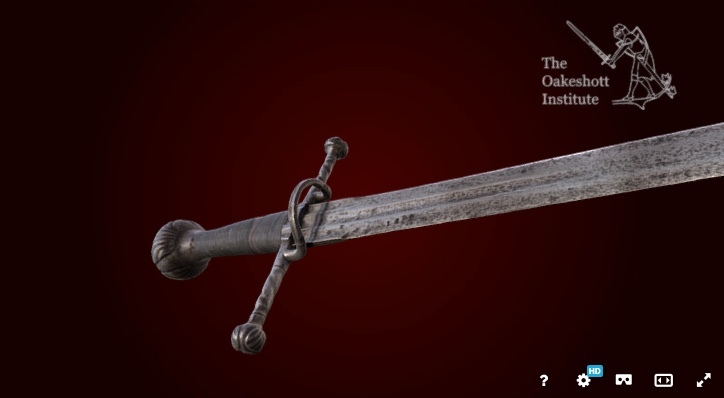 The Oakeshott Institute is excited to announce the next step in our Historical Sword Documentation Project. Our mission to collect and disseminate information on artifacts progresses into the realm of 3d modeling. Starting with the items in our care we will catalog these pieces and provide contextual materials. This will allow scholars and enthusiast to experience these items in ways that have not been possible in the past, even with the item in hand. The basic models will be open to all with supporting information, articles and additional images. Some of these will be accessible via a fundraising effort to support this work and expand our project to other collections and pieces as we offer this service to collectors and institutions alike. Our goal with this is to expand the breadth and quality of understanding of these objects in context for all. The project is one we foresee as ongoing for sometime to come. Please let others know about our project, if you see it as having value for their interests and we welcome support for our efforts. If you are interested in contributing content or collaborating on efforts please get in touch with us at the emails below. We look forward to hearing from you. We think this is an exciting addition to the scholarship of arms and armor, one that provides new insight and a great deal of promise to further our mission. First official model launch Oct 1st mid day central US time. Fellow of The Oakeshott Inst. Awesome. Just became a patron of this on Patreon. Thanks for doing this work Craig and Dale, and thanks for giving all of us a chance to participate in your efforts. Here's Roland talking about this project for anyone interested in seeing video of the models. Posted: Mon 02 Oct, 2017 12:13 pm Post subject: First Monthly release now up! Our first Monthly release now up. First time I posted link got sketchy so reposting if it does not work use link in first post. This will be an unprecedented advance in the historical arms community! Can't wait for more additions! I eagerly await!!! That's fantastic ! You're making an incredible job, and this is truly a great idea. Can't wait to see what will follow! Posted: Tue 03 Oct, 2017 9:34 am Post subject: Re: First Monthly release now up! Our first Monthly release now up. The hollow-ground ricasso with central fuller on this Italian arming sword is extremely similar to the one on Albion's Viceroy. Only noticed it when I turned it end-on (see attachment). I am amazed at the level of detail you guys captured here, and how easy it is to manipulate the sword in three dimensions. Also appreciate the annotations, including things like the blade thickness/distal taper. This is monumental, game changing. I was excited in the past in just getting two views of a sword. This is incredible! Thank you for the hard work. We now have 12 models published in our Historical Sword Documentation Project (HSDP). The Oakeshott Institute continues our work to share these pieces. Several more models are underway and research continues as we document our collection. Look for more information coming that will provide context and more details. Keep watch as items are added. Our latest model is this 15th Longsword which is an exceptional example of a well made fighting sword of the period. Check out more info at our Pateron page which has links to the models and support information. Keep updated on all of our activities on our facebook page.